I went for a blast on the ol' Ultra today. After riding for awhile the throttle would start to stick, more on the faster side. You could feel where it would start to get harder to pull and if you tried to pull through it, it would stick. Thank goodness for the safety switch, 1st time it stuck was on a curvey trail! I could stop for a few minutes and then it would quit for awhile and start again. It was 31 degrees today not very cold. I shot some lube down the cable tonight, try it it the morning. It almost felt like a slide in the carb was sticking. Never had this prob before, any ideas? well well, the good old sticky throttle. Unscrew the throttle slides from the carbs and see what's happening. Or you could just leave it and make life interesting ok maybe not. A guy brought me a sled once that he was having similar troubles with and he had accidently bent one of the needles while trying to get the slide and cap back together. I found the problem straightened the needle,and the problem was gone. 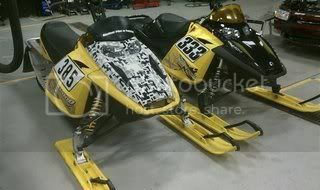 Not to sound like The Dad or anything but sled cables should never ever be lubed. They're different than a dirt bike cuz they're made with a teflon lining that lets them slide in the cold.Lubes get thicker in the cold and constrict the cable, and some lubes like WD40 will freeze. Also was it snowing or were you in asleds sno-dust when this was happening. If so check your snow filter or screen an see if it came loose.